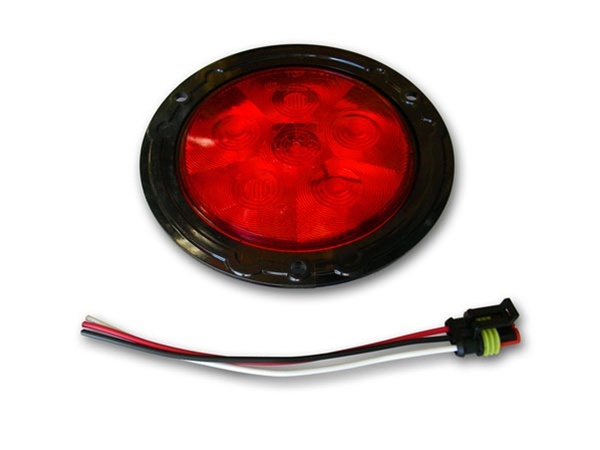 6-diode flush mount LED taillight with red lens for use with Poison Spyder Customs Crusher Corners, Trail Corners or any other manufacturer's corner protectors, or anywhere you can cut a 4-1/2" hole in a flat sheetmetal panel. Flange-mounting style, red lens. Sold by each, if you need a pair specify a quantity of 2. This is the second Jeep that I have used these lights on. They are easy to install and last a long time, plus they take a beating. I placed my order on-line and the ease of shopping was great. The delivery was very prompt and the parts were received as expected. Thanks. the jeep. makes it easier to sautter the wires. u definitely need the led flasher napa has other for like 27 bucks. i really like this product.